So, I mentioned that I got sucked in to the Farmer's Wife Quilt Along on flickr. These blocks are really addictive! I don't guess I'm going to formally follow the two blocks a week schedule a the quilt along, but rather just work on them when I need a quick sewing fix. Actually, I use the term "quick" very loosely. That green, pink and gray block above, it's block #47 in the book, Homemaker. I'm so glad I have that one out of the way! I wasn't timing myself, but I suspect that block took me almost two hours. It was my first experience with Y seams in quilting and the one thing this book lacks for these blocks is instructions. This block had some notes that other blocks didn't have, but it still took some time to get it done right. I'm very pleased with the outcome though; I think it's my favorite block thus far. I read that someone else was trying to alternate tougher and easier blocks and that sounded like a great plan to me. I don't want to put off all the challenging blocks to the end and then never finish because of frustration. Speaking of finishing, I need do a round up of all my UFOs (UnFinished Objects) and take a look at everything I've got in the works. Maybe if I put them all together in a post, it might help me prioritize and get excited about finishing some things up. 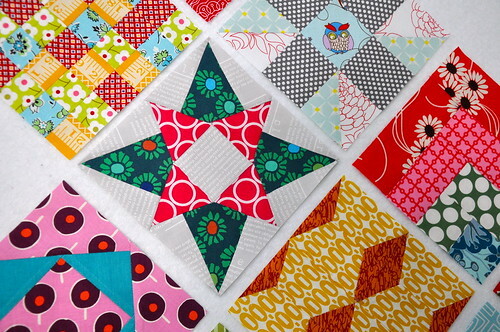 I did work on the hexagon charm quilt this weekend for the first time in months. That beast deserves it's own post. Good idea to alternate difficulty level! Yours looks Fantastic, love the block you repeated. I love the vibrant colors in your blocks. I haven't started the quilt along yet but I do own the book. I may just start it after I get my cast off of my hand. I'm looking forward to seeing more of your blocks. I just love your blocks! So fun and great fabrics. 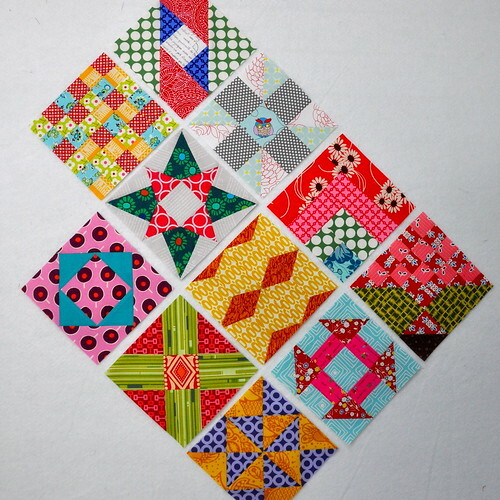 I'm just finishing up my quilt - only about 10 blocks to go - but I'm boring and doing mine in repros. I think I need to make another one in such fun fabrics. Those blocks are addicting! Homemaker looks like a doozy but it turned out great. I love the fabric combinations. I'm doing the blocks in the order they appear with the letters, so sequentially. Cut Glass Dish has 51 pieces, all little 1" HST units. It was my first block in the book and took me forever! Whew. So I'm posting each week as Farmer's Wife Friday, with a little review of the letter as well. P.S. haha. 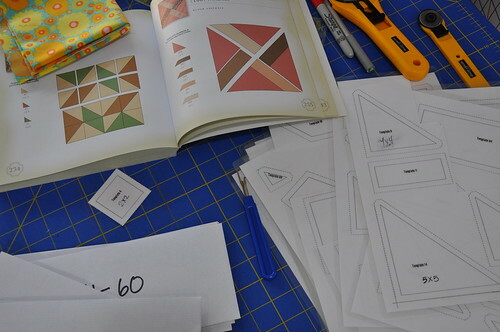 My word verification is "ungluese"--kind of like unglued which I how I felt when working with all those little triangle pieces.